The first violin part for Tchaikovsky's Nutcracker Suite, Op. 71a has been edited by Ilya Kaler, who has appeared as guest concertmaster with the San Francisco Symphony, Philadelphia Orchestra and Baltimore Symphony. Kaler's bowings, fingerings and other editorial markings have been added throughout the score. The Nutcracker is one of the most well-known and popular ballets in the world today. Yet, when it premiered in 1892 it was not a success. However, the 20-minute suite that score composer Piotr Ilich Tchaikovsky extracted from the ballet was. Over the years its popularity continued to grow, particularly since the late 1960s. The influence of the suite has made the ballet as a whole one of the most performed productions, especially during the Christmas season in the US. The score is one of Tchaikovsky's most famous compositions, with special attention on the pieces featured in the suite. Tchaikovsky made a selection of eight of the numbers from the ballet, performed earlier in the year of the 1892 premiere, forming the Nutcracker Suite. Upon its first performance it became instantly popular. The suite opens with the Overture, before launching into a series of famous character dances (including Dance of the Sugar Plum Fairy) and concluding with Waltz of the Flowers. 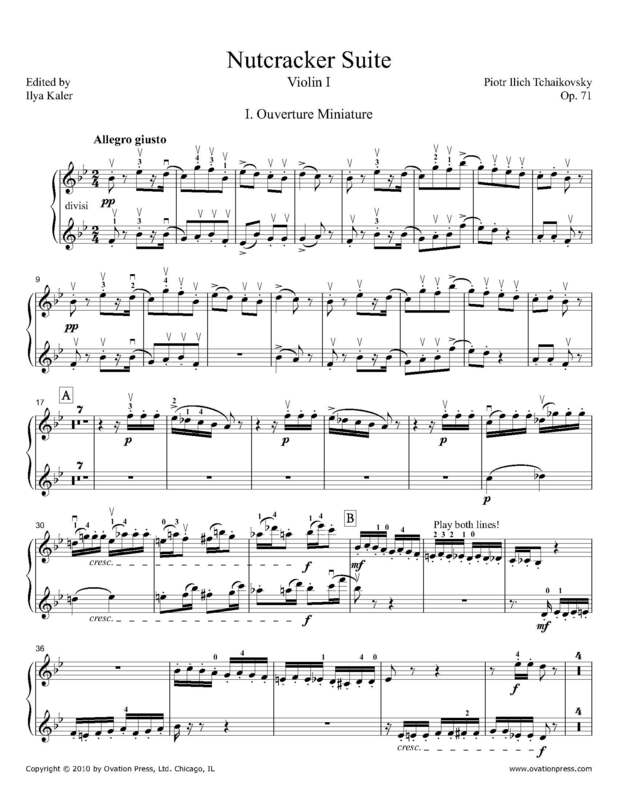 Download and print the score today to gain access to expertly edited Tchaikovsky Nutcracker Suite violin fingerings and bowings from Ilya Kaler!